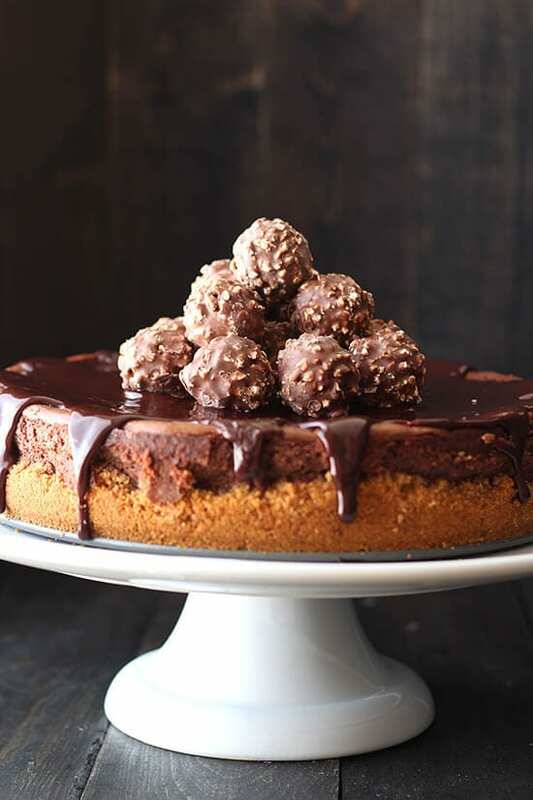 Nutella Cheesecake is the ultimate decadent dessert with tons of Nutella, a rich and fudgy chocolate ganache, and garnished with Ferrero Rocher candies! It's CRAZY good!! Taste: The chocolate and hazelnut combination is one of the most scrumptious love stories in the world of desserts. I am utterly obsessed. 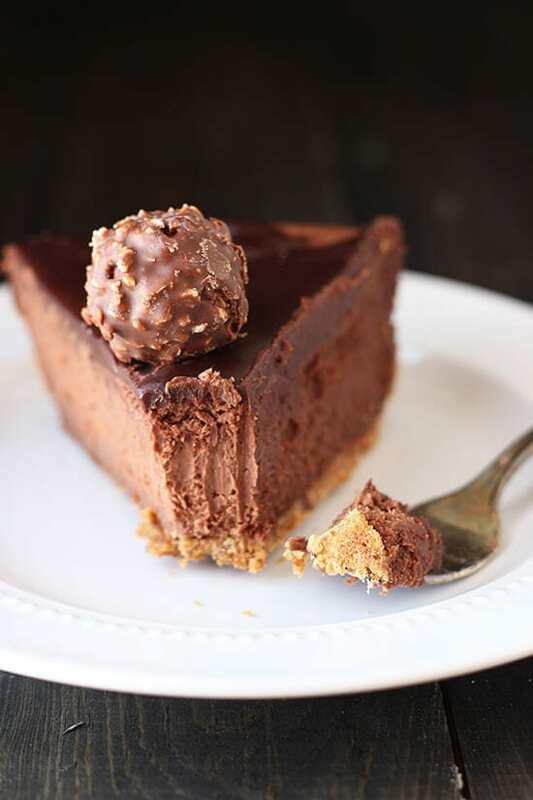 Texture: Rich, creamy, and luscious, with a buttery crunchy graham cracker crust and a satisfying bite of Ferrero Rocher candies to top it off! Ease: Surprisingly easy, but you will make a bit of a mess. Appearance: If heaven ever sent a cheesecake to earth, it would look like this! Pros: Totally doable yet completely impressive, not to mention decadently delicious and can be made ahead of time! Cons: Diet killer. Yolo? Are people still using that word? Would I make this again? Next special occasion for a Nutella-lover! You are going to love to hate me for this ridiculously indulgent and totally divine Nutella Cheesecake recipe. Years ago I had shared a recipe for Nutella cheesecake that needed some updating. I took that recipe, which almost seems quaint in comparison now, and turned it up about a hundred notches. 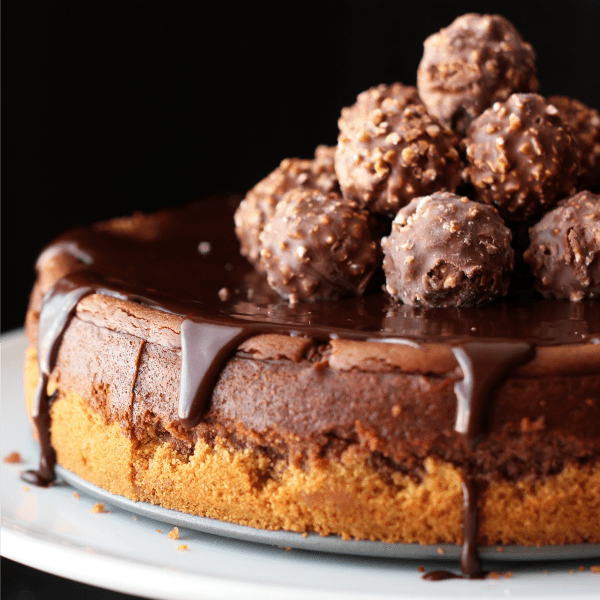 I increased the amount of Nutella in the cheesecake to a whopping 1 1/2 cups, added a rich and fudgy chocolate ganache on top, and finished it all with a generous pile Ferrero Rocher candies. It’s the least I could do to honor the passing of Pietro Ferrero, the heir and CEO of the company that gifted the world with Nutella. -Make sure to use a high-quality springform pan for this recipe, no other pan will do! 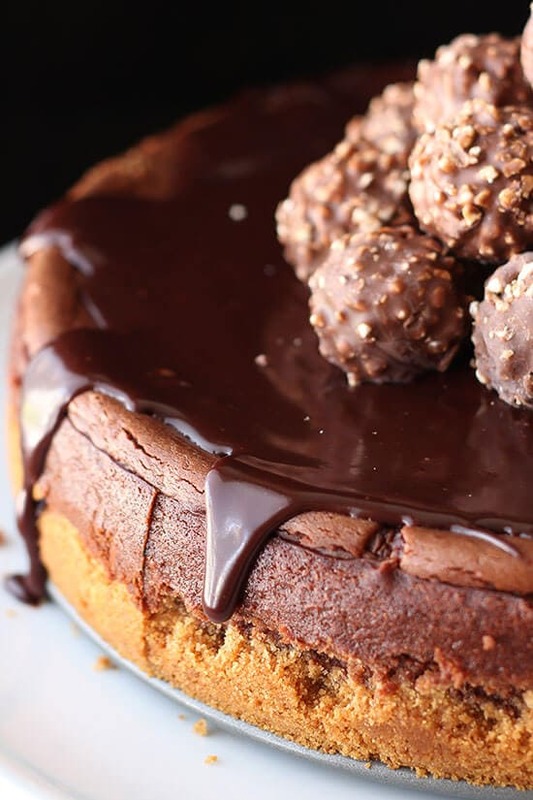 -Since we are topping this cheesecake with a thick layer of ganache and with Ferrero Rocher candies, there’s no need to take the extra steps of using a water bath or letting the cheesecake cool in the oven. 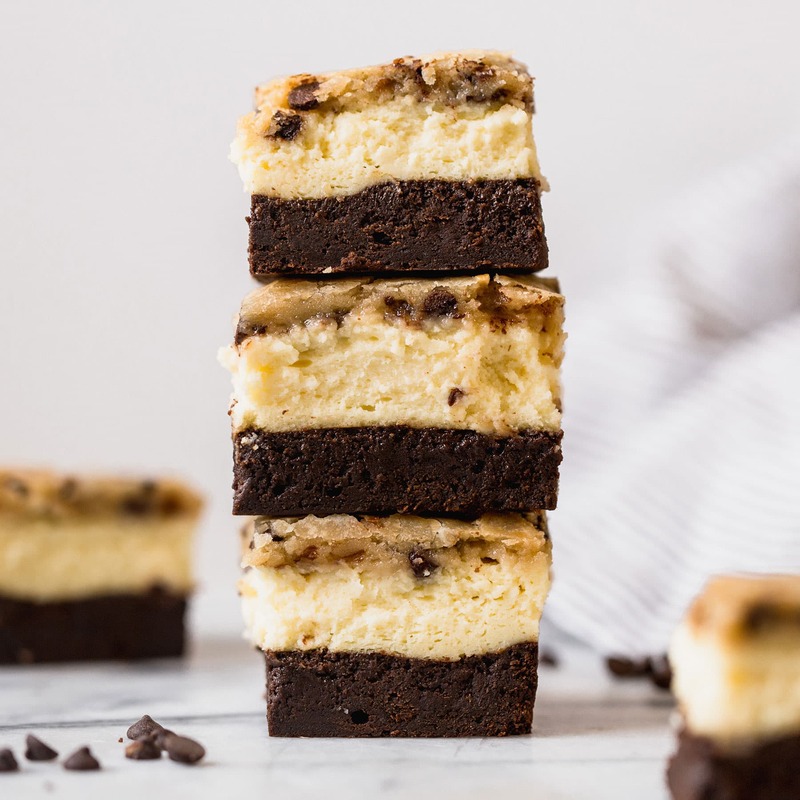 These prevent the cheesecake from developing cracks in it while baking and cooling, but cracks don’t matter much in this recipe! -Do not overbake! If the cheesecake is still a bit jiggly after the baking time, that’s perfectly fine. It’s better to err on the side of underbaking than overbaking (remember, there are “no bake” cheesecakes) and the cheesecake will continue to bake after it’s removed from the oven due to the residual heat. -Do not overmix! We do not want to add too much air into the cheesecake batter, which will lead to cracks (not a big deal here) or worse, will lead it to puffing up and even spilling over the edges. Beat the cream cheese as much as you need to in order to get rid of any lumps, but once you add the eggs beat just enough to combine, no more. Preheat the oven to 325°F. In the bowl of a food processor, process the graham crackers until they are finely ground crumbs. Add the butter and pulse until moistened. Press into the bottom and halfway up the sides of a greased 9-inch springform pan. Bake for 10 minutes. Place on a wire rack to cool. Maintain oven temperature. In the bowl of an electric mixer, beat the cream cheese until smooth. Add the cooled melted chocolate and then the eggs, one at a time, beating just until combined. Add in the sugar, cocoa powder, Nutella, cream, vanilla, and Frangelico (if using) and beat until combined. Be careful not to overbeat. Pour the batter into the cooled crust. Bake for about 1 hour, or until set and the top looks slightly dry. If the middle is slightly wobbly, that’s fine. Cool the cheesecake completely on a wire rack. Refrigerate until completely chilled, at least 4 hours. Release the cheesecake from the pan onto a cake stand or serving plate. Place the chocolate chips in a medium heatproof bowl. In a small saucepan heat the cream just until simmering. Pour over the chocolate chips. Let sit for 3 minutes before stirring until the mixture is melted and smooth. Pour over the cheesecake, allowing to drip down the sides. Top with the Ferrero Rocher candies. Serve or cover and store in the fridge for up to 2 days. You are my hero. I actually wonder if you could solve world peace with this cheesecake… Ha! Wow! This cheesecake does look crazy good! I may or may not have drooled all over my keyboard! LOVE your recipes I have already tried so many of them. 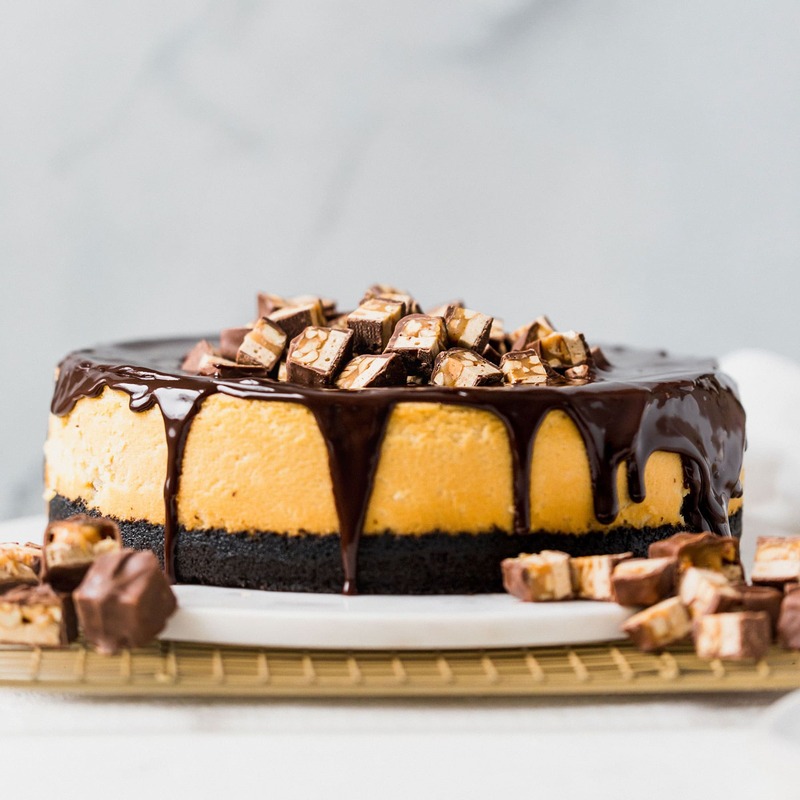 I found you on pintrest through your peanut butter cheesecake recipe, and now you are my GO TO site for whenever I need to make a treat! Love this! 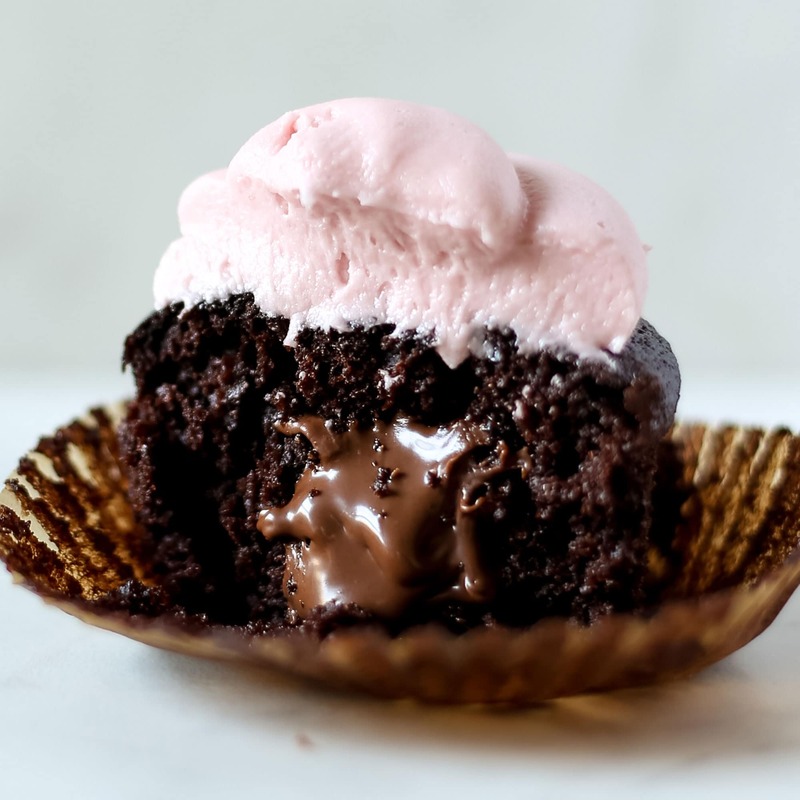 Your dessert recipes are always amazing, but this is just too much! YUM! Oh my, this look so amazing! Especially because of the amount of nutella. It looks so decadent and delicious, the Ferrero Rochers make it look even more tempting, pinned! Nutella and Ferrero Rochers are my favorite!! This looks decadent! Pinned. Wowza! I need this in my life. I don’t keep nutella in my house very often because I will eat the entire jar in one sitting, but looks like I have an excuse now. I’ll bake with it! Cheesecake for everyone. Oh wow this just looks super delicious. Thanks for sharing this. So, I’m curious. Has anyone substituted the chocolate chips for the topping with white chocolate? Can’t wait to make this. Just wondering if I could make mini ones instead of one big one? Should I bake at the same temperature and for how long? Tessa, this looks amazing! Do you think the graham cracker crust works better for this recipe than a chocolate/Oreo crust? It’s simply a matter of preference! 5 eggs causes the cheesecake to rise too high…it’s more like a soufflé. I’d suggest using only 3. I used 3 eggs and it’s still popped up like a soufflé. A small piece goes a long way and homemade whipped cream is a great addition. It is definitely a rich cheesecake, so I cut a couple pieces and am freezing the rest for a quick treat. This was delicious and so easy to make! Very decadent so agree it will need to be eaten in multiple sittings, but I expect it will freeze well. I added a bit of sour cream to increase the tanginess and offset some of the sweet. And unsweetened whipped cream is the perfect accompaniment. Look forward to trying more of your recipes! Uh oh! I ended up with way too much filling for my (9″) springform pan. I left out quite a bit but it is rising up above the pan edges! I was careful not to over mix and I’m sure I got all my measurements right. I wonder if I should try to cut off the top or leave it? Any advice? It needs to be pretty because I am baking it for an auction! Help please! Hi Tessa – OMG – I so have to bake this. Love Love Love your blog.Thanks for sharing the recipe. I am from Australia and we don’t have Graham Cookies here – could you please tell me how much does those 14 Graham Cookies weigh altogether. So that I can substitute Graham Cookies and get the quantity of the crumbs right. I was wondering, for about how long will this cheesecake stay good? I was disappointed! I made it for a Nutella loving friend for his bday and we all agreed that you could really only taste the chocolate! In order for it to have the true Nutella taste could you just omit the chocolate?! Hello, I need a little help..
Did you use a springform pan? I’ve tested this recipe in 2 different brands of 9-inch springform pans without any issues! My 11 year old daughter who absolutely loves Nutella made this cheesecake to enter into the County fair. She wanted to do a cheesecake this year because her brownies last year got beat by a cheesecake. 🙂 She made one change and made a chocolate cookie crumb crust instead of a graham cracker one and guess what? She won Best of Show!! Everyone who has tasted it over the last 2 days said it is absolutely delicious. Thank you so much for sharing this wonderful recipe. My daughter was so excited to win. 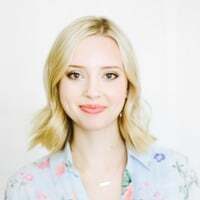 Hi, this is Jordan checking back in. My no-cream-cheese, Greek-yogurt-instead Nutella cheesecake turned out amazingly! Well met.